A Gnosall tea room is to throw open its doors to people who face a Christmas alone. Lily’s Secret Vintage Tea Room will provide free coffee, mince pies, Christmas music and a fun festive quiz on Friday, December 23. The tea room, which is tucked away inside Swan Pit Nursery, Gnosall, will be open between 10am and 1pm for people to drop in and enjoy refreshments. “Studies by Age Concern tell us that around 1.2 million older people in the UK fee isolated and this can feel even worse at Christmas time,” said Lily’s owner, Sarah Lewis. “It is a time of year when you revel in the comfort of having a family and this can lead to people who have lost their love ones feeling more alone than usual. Sarah hopes the families of funeral wakes she has catered for this year and their friends and loved ones will attend on December 23 as well as the general public to share a little Christmas cheer. 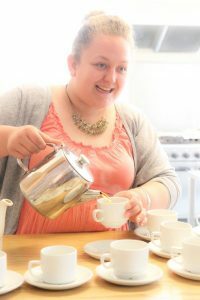 A trained chef, Sarah, founded Lily’s Secret Vintage Tea Room in 2014. The “secret” tea room is tucked away in the nursery off the main A518 Stafford to Newport Road.